1. The necklaces are adorable. 2. There's a scandal involved. Isn't that perfect for an Etsy Love post? Here's a link to the pieces I love from the "A World of Love" collection from the Tru.che shop by Stevie K. on Etsy. See how cute? 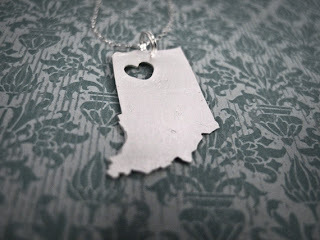 (Even though I live in Ohio now, I'll always be and Indiana girl at heart!) Prices range from $55-$60 depending on the state. And now for the scandal. Last week Tru.che shop owner Stevie K, found similar designs being sold by Urban Outfitters- see her post here. After a little digging, I also found Urban Outfitter's reaction to Stevie K.'s claim. Call me crazy, but usually companies are a little more apologetic in these matters-- but that post is not in the least way diplomatic if you ask me! And the the similar designs (called the "I Heart Destination" collection by Urban Outfitters) are no longer found on their website... which makes UO seem even more guilty! It looks like Stevie K is receiving an influx of orders though, due to the little scandal... so I think everything worked out for the best! Long live independent designers and artists! Which state do you heart? 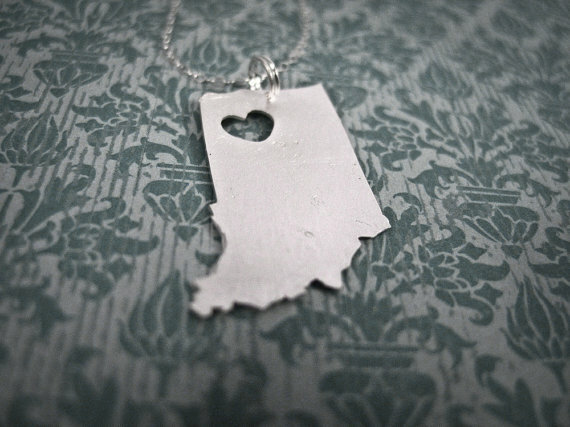 Have you found or ordered something great from Etsy lately? Or do you have an Etsy shop you think I may be interested in featuring? Email me at Laurealism at gmail dot com! Far from original. I bought same exact pendant in 1978 at ChicagoFest. Now I ask, who is borrowing from who? This was a copycat whiner with a thinly veiled promo, who made bogus claims and has over $70,000 in sales to show for it.